TULSA, Okla. — The day started, like so many others before, with Sarah Palin going rogue. The frenzied media storm that whirls around the former Alaska governor collided Wednesday with the billionaire whose understanding of media spectacle has made him the strongest political force this election cycle. Palin was nowhere to be found Wednesday morning during a planned joint appearance with Trump in Norwalk, Iowa, part of a campaign swing through the Hawkeye State meant to highlight her high-profile endorsement of Trump the day before. That endorsement flew off script after news broke that Palin’s eldest son, Track Palin, had been arrested on domestic assault charges. For many, the pileup of national political theater and family drama carried surreal echoes of the 2008 election, when Palin was catapulted to the national stage after GOP candidate Sen. John McCain, R-Ariz., made her his unexpected running mate. The campaign was quickly consumed by Palin’s persona and family, including the revelation that Palin’s teenage daughter was pregnant. Now there is a different Republican candidate, but the same Sarah Palin. As reporters hounded the campaign with questions about Palin’s whereabouts and whether she would attend the second event of the day in Oklahoma, thousands of voters gathered outside the Oral Roberts University Mabee Center in Tulsa for a chance to see Trump. The flamboyant businessman finally appeared on stage an hour behind schedule. Trump appeared first and introduced Palin, then she introduced him back. After she took the stage, Palin addressed her son’s legal problems by alluding to his difficulty adjusting to civilian life after serving in the Army during the Iraq war. Track Palin allegedly struck his girlfriend Monday with a closed fist and threatened to shoot himself with an AR-15 rifle, according to a police affidavit. Sarah Palin knocked President Barack Obama’s record on veteran’s issues as she spoke, accusing him of failing to look after wounded warriors. “I can talk personally about this. I guess it’s kind of the elephant in the room, because my own family going through what we’re going through today with my son, a combat vet having served in a striker brigade. … Like so many others, they come back a bit different. 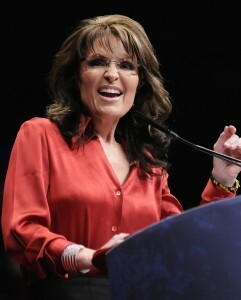 They come back hardened,” Palin told the crowd. If the man she was on stage with were anyone but Trump, she may have stolen the show. Instead, they embraced before he took the microphone and began his typically raucous stump speech. She left the stage and fell out of sight. “I love it. We’ve been to a couple of these (political events) and this is by far the wildest, best one. We had to wait an hour to get in but it was worth it,” said John Schwartz of Broken Arrow, Oklahoma. When asked if they were excited to see Palin, many said they were there to see Trump but that they believed Palin could help him appeal to more voters. She is, they said, at the very least entertaining. Art Matzkvech of Tulsa laughed when asked if he thought there was any risk of Palin overshadowing Trump. “No,” he said with a smile.